In the fight against the e-commerce giants, brick-and-mortar retailers have a winning card: customer experience. Many factors contribute to making an in-store experience unique and compelling. A curated product selection, an exciting and fresh atmosphere, and personal, one-on-one service are just some of the elements retailers can use to their advantage. Unfortunately, not all retailers seem to be playing their cards well. Last year alone, Accenture reports, 61% of customers stopped doing business with at least one company because of poor customer experience. Research by Omnico Retail Gap Barometer reveals an even darker figure: 72% of consumers actually see all shopping as a frustrating experience! Brick-and-mortar shopping was found to produce even more irritations than online, with over a quarter of respondents describing the average in-store shopping experience as poor. Let’s take a closer look at each factor, and see what tools can help close the gap between what consumers expect and the current, disappointing experiences many retailers still offer. The majority of retailers (61%) are confident that their store associates deliver great value and best-in-class assistance to customers, according to research by Forrester. Shoppers, however, disagree. Most (51%) consumers surveyed in the very same research believe that salespeople are not as knowledgeable about products as they should be. It is unsurprising, then, that very few consumers – less than one out of three – decide to rely on stores associates when they need to find a product. Do you want your employees to deliver helpful, knowledgeable service? Then empower them to do so. This means giving them constant training, and the right technology. Training: Learning about products and excellent service should not be limited to the onboarding stage. Keep your staff up-to-date with what stock is coming in, and help them understand how each item can suit different customer needs. A shopper looking for new running shoes doesn’t want to hear “here is what we have” – or wait around while the sales associates tries to read the boxes to understand the difference between two pairs of sneakers. What the customer expects is solid, competent advice on what sole is better for rough terrains, or which model has the best arch support. The in-depth knowledge needed for this level of service does not come cheap: you need to invest time and resources in constant, thorough, focused training. Technology: Even with constant training, you can’t expect your employees to memorize your whole catalog and all your products’ features – especially in the days of endless aisles. A simple and affordable way to empower your employees to give more personal service is mobile Point of Sale. With a mobile POS in their hands, your employees can walk around the shop floor and give product information and one-on-one service to your customers where they are. On the POS, salespeople can quickly find all information on product details, variants, prices, and even real-time availability across all your locations. And it doesn’t end here. The best mobile POS systems also enable your employees to view, and show to customers, your whole product range, not just what you have in-store. A customer is looking for a specific type of paintbrush? Use the tablet to show the products available in your other locations and compare items side by side, with details and pictures. And to finish, you can close the sale on the spot. Yes – the best mobile POS take payments, too. In today’s hyper-connected world, the points of interaction and purchase just keep on multiplying. People can buy the t-shirt their favorite rapper wears straight from the music video. They can purchase a necklace on the jewelry designer’s Facebook page. They can replenish their kitchen detergent by pushing the Amazon Dash button they keep next to the sink. They can buy a new pair of headphones on their mobile, and select to pick them up in their favorite store location, or at a delivery box close to their home. They can use voice recognition to ask Alexa about the best wine pairing with ossobuco – and get the bottle sent home. Across these increasingly diverse shopping moments, customers expect their experience with each retailer to be smooth and consistent – no glitches, no hitches, no disconnects. As consumer expectations keep on growing, the gap with what most retailers offer gets larger. According to BRP’s latest Customer Experience/Unified Commerce Survey, the majority of retailers still don’t offer basic cross-channel capabilities such as stock visibility, start-to-end order tracking, or cross-channel returns. A case in point: none of the retailers interviewed by BRP said they could offer effective “start anywhere, finish anywhere” (shared cart across channels) services. At the same time, almost 3 out of 4 (73%) consumers believe that this is a key capability. How can you bridge the gap? Unified commerce is the latest tendency in retail management systems. Unified commerce replaces all the separate, badly connected software solutions and databases retailers use across their business with just one, centralized, enterprise-wide software platform combining POS, mobile, Web, inventory management, customer information, and more. Within a unified commerce system, all information is maintained in one place, and shared and distributed instantly to all touchpoints. This means both your staff and customers can have access to the same, real-time data, including prices and offers, which and how much stock is available in each location, as well as customers’ shopping history. By unifying all information and making it available across the enterprise, a unified commerce platform ties all loose ends, enabling retailers to achieve, and offer their customers, total visibility, consistent information, and smooth experiences across all points of interaction. The vast majority (85%) of retailers, Forrester reports, believe they do a good job at personalizing their messages to each single consumer’s tastes, interests, and past purchases. Once more, shoppers disagree. More than half (59%) of consumers interviewed in the same survey say that retailers do not know them, and that the personalized offers and communications they receive tend to be irrelevant and untimely, providing no value to them. Ouch! Last year alone, according to data from Accenture, 33% of consumers who abandoned a business relationship did so because they felt personalization was lacking. Mass-made, one-size-fits-all products, offers and messaging don’t cut it anymore. Today’s consumers are used to receiving targeted recommendations, designed-for-you communications, and even personalized prices online, and they have come to expect the same level of individual attention across all channels. To deliver this kind of experience across your whole enterprise, including brick-and-mortar locations, you need unified commerce systems, and Artificial Intelligence (AI) tools. By maintaining all customer information in one database, unified commerce enables retailers get a straightforward, real-time picture of their customers’ habits, preferences, buying history, and behaviors. This highly organized data can then be run through predictive analytics and artificial intelligence services to deliver more effective, engaging, and personalized customer interactions. A good example of one such service is LS Recommend. This AI-powered recommendation engine uses historical purchase data to deliver relevant product recommendations. These suggestions can be shown on the e-commerce site, viewed on the phone of loyalty program members, or even displayed at the Point of Sale. In this case, sales associates can use them to engage customers, delivering the recommendations in the form of a personal suggestion. And thanks to machine learning, the system becomes increasingly accurate with time. Many retailers are feeling outpaced by today’s speed of change, with consumer expectations constantly increasing on the one hand, and technology quickly changing on the other. “By the time we catch up to technology, it will have moved past us again,” a billion-dollar revenue retailer told Forrester. The good news is, you don’t need to offer drone delivery, virtual reality, or 3-D printed items to guarantee great experiences. Rather, implement the technology that enables you to deliver the necessary, and oh-so-important basics of modern shopping: competent service in-store, personalized interactions, and a consistent brand experience across channels. You can find all the elements you need to offer all this in a retail management system like LS Nav, our unified commerce platform that gives retailers mobility and a centralized view of all their information, including customer data. To know more about LS Nav, and how it can help you close the gap between what consumers want, and what you can offer, get in touch with us. 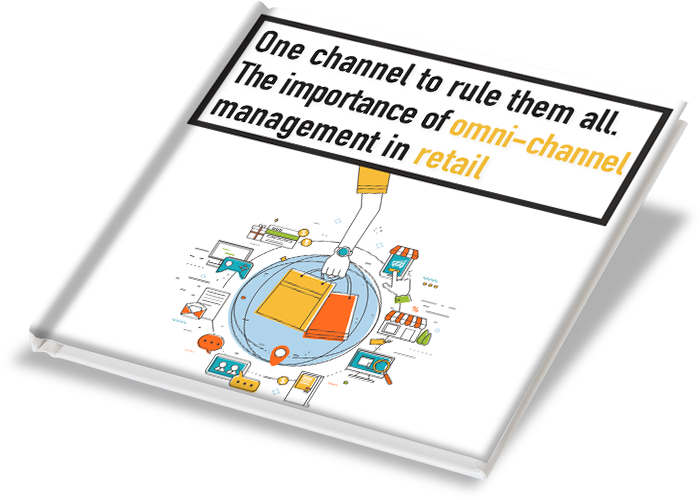 Boost revenue, gain a competitive edge, and drive return visits with a successful omni-channel strategy for your retail store. Find out how.